Should we start de-extincting species that have died out? Futurist Stewart Brand, founder of The Long Now Foundation, has a new mission in life. He wants to bring extinct species back from the dead. Some ecologists thing that's an awful idea. Here are the arguments on both sides of the de-extincting debate. Over at Environment 360, Brand debates this idea with Paul Ehrlich, a Stanford population biologist and co-author of The Population Bomb. The debate ranges from conservationism concerns, to ways we can make environmentalism into a cutting-edge science. Has Humanity&apos;s Explosion Become a Population Bomb? Brand believes we can restore lost habitats by bringing back "keystone species" that shaped those habitats. Plus, the technology required to bring back extinct species could make environmental science into a major field in the world of biotech. 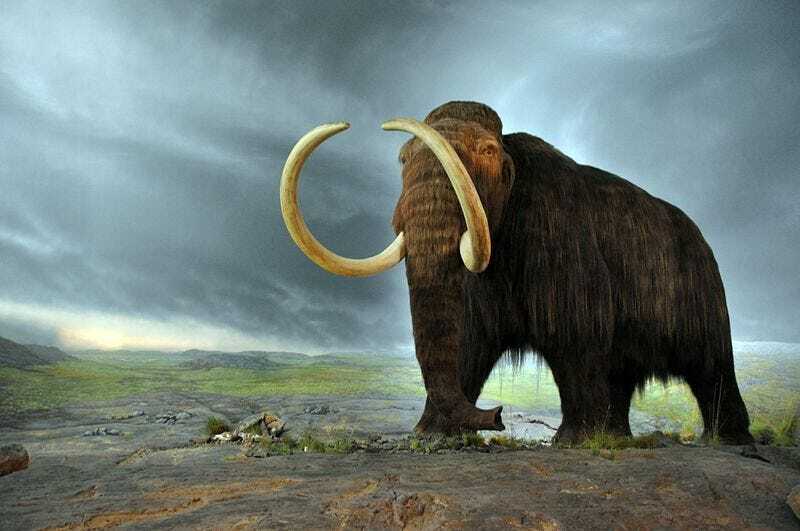 The woolly mammoth was one of the most important keystone species of all, according to Sergey Zimov, the Russian scientist who founded "Pleistocene Park" in northern Siberia. When the herds of northern megaherbivores were killed off by humans ten millennia ago, Zimov says, the largest biome on earth, called the "mammoth steppe," converted from grassland to boreal forest and tundra. In these days of global warming, thawing tundra is releasing greenhouse gases, whereas grassland fixes carbon. Zimov is currently restoring grassland in the far north with muskoxes, wisents, and Yakutian horses. He is waiting patiently for mammoths. "We knock down the trees with military tanks, but they make no dung." . . .
We protect endangered species, conservationists retort (and most of the public agrees), in order to preserve the richest biodiversity we can, to retain creatures that have important ecological roles, or that people love, or as emblems to protect whole endangered ecosystems. We protect them to learn the science to protect them better. We protect them to undo harm that humans have caused. All those reasons apply to bringing back extinct species, plus some — such as the pure thrill of the prospect of herds of mammoths bringing tusker wisdom back to the far north, or clouds of passenger pigeons once again darkening the sun. It would be a reframing of possibilities as momentous as landing humans on the moon was (at a tiny fraction of the cost). Conservation biology would leap to the forefront of genetic science. The conservation story could shift from negative to positive, from constant whining and guilt-tripping to high fives and new excitement. Passenger pigeons were North America's most iconic extinction. When they were slaughtered from billions to zero in the late 19th century, we caught on that the same was about to happen to the American bison, and the protection of endangered species became an established idea and practice. How fine it would be to reverse the founding human mistake that inspired modern conservation. It would mean that conservation biology has come full circle. So what are the objections to an effort to start making amends for anthropogenic extinctions by trying to restore the victims to life? The soundest scientific reason, in my view, is misallocation of effort. It is much more sensible to put all the limited resources for science and conservation into preventing extinctions, by tackling the causes of demise: habitat destruction, climate disruption, pollution, overharvesting, and so on. Spending millions of dollars trying to de-extinct a few species will not compensate for the thousands of populations and species that have been lost due to human activities, to say nothing of restoring the natural functions of their former habitats. Sadly, most non-scientists, and too many conservation biologists, who really care about the decay of biodiversity, are concerned about preventing the extinction of species, and the de-extinctionists thus naturally focus on resurrecting species. In part, this traces to a mistake my hero Charles Darwin made by mistitling what I consider the most important book ever written "On the Origin of Species" instead of "On the Differentiation of Populations." Among other things, this has led to a century of pointless argument about how to define "species." It's as if geologists wasted their time in interminable ranting over how to define "mountain." How high does it have to be? How isolated from other high points on a ridge? How steep the slopes? More important, this species-centric view also has led to the conservation focus being on species, even though right now the critical problem humanity faces is not species extinction but one of the extinction of populations. Populations are the entities that deliver crucial ecosystem services to society and the ecological engines that sustain and create species. Of course, when all populations of a species are gone, that species will be extinct, but there are orders of magnitude more populations than species disappearing today. And in most cases, as populations disappear and species extinction becomes more likely, the value of the organism as a service-provider approaches zero, including the aesthetic service of giving us the joy of watching or interacting with it. Resurrecting a population and then re-inserting it into habitats where it could supply the ecosystem services of its predecessor is a monumentally bigger project than recreating a couple of pseudomammoths to wander around in a zoo. The passenger pigeon is often mentioned as a target for de-extinction. Passenger pigeons once supplied people with abundant meat and likely helped to suppress Lyme disease. To create even a single viable population might well require fabricating a million birds or so, since the species apparently survived by a strategy of predator saturation. And if the swarm were synthesized, where could it be introduced? The vast forests the pigeons required are partly gone and badly fragmented at best, and one of the birds' food sources, the American chestnut, is functionally extinct. The passenger pigeon's previous habitat is utterly transformed, and if humanity does not very quickly and substantially curb greenhouse gas releases, the pigeon's old homeland will likely be completely unrecognizable in less than a century. In practical terms, in the near future in which action is required, extinction is certainly "forever."